Today was a tough day for stock investors. A toxic brew of bad news caused another round of market sell off, but now the volume is increasing, which is definitely not a good sign. 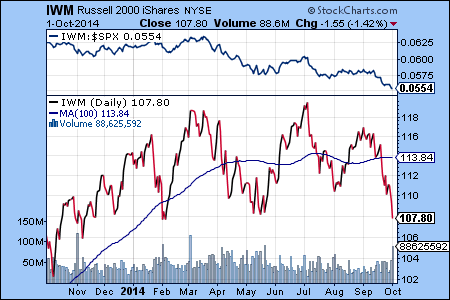 The Russell 2000 index, representing small cap stocks, was hit the hardest out of the major U.S. stock indexes. 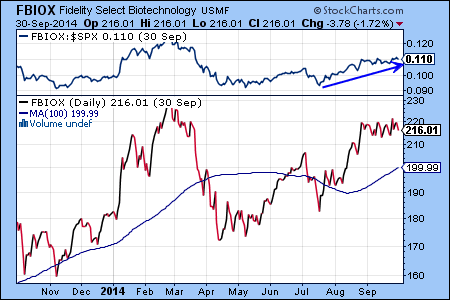 Small cap stocks typically outperform during the expansionary phase of the economic cycle. 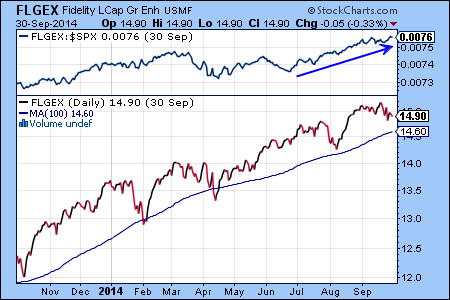 Consequently, the underperformance of the small cap index versus the large cap S&P 500 index is a worrisome sign. In spite of the best efforts by the ECB, increased concern about economic contraction in Europe has caused Eurozone markets to enter a downtrend in July. As the Wall Street adage says, “do not try to catch a falling knife”, we believe that investors are best served to continue to avoid Eurozone investments until the proverbial knife hits the floor. Currently, no floor is in sight. Crude oil and other commodities tend to be priced in dollar terms, so as the dollar rallied against all major currencies starting in July, stocks in the energy sector to sell off. 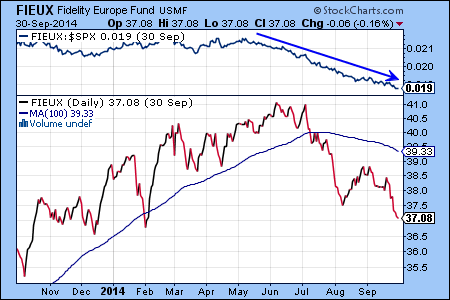 The sell off is also exacerbated by concerns about a possible world-wide economic weakness. 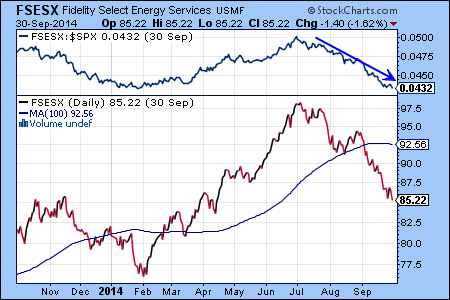 We will continue to watch the relative strength of the energy sector compared to the S&P 500 index to look for a turn-around that may be similar to what we have seen in February. On the bright side, the bull market is still intact for large cap stocks as investors seek out the safety of blue chip companies. 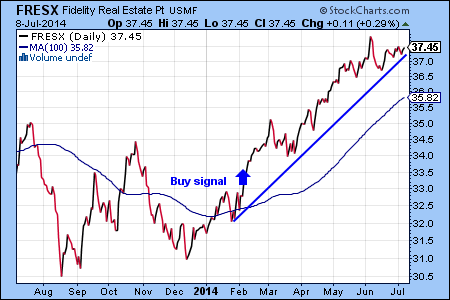 As we reported earlier (see article), a rotation of capital is under way into large cap stocks. 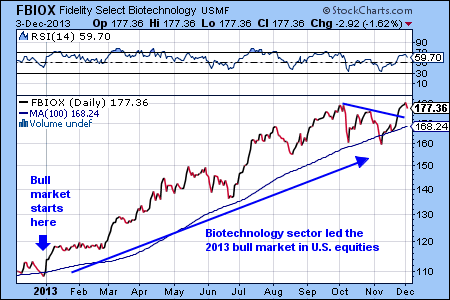 Biotechnology is another area of the stock market that is still holding up. 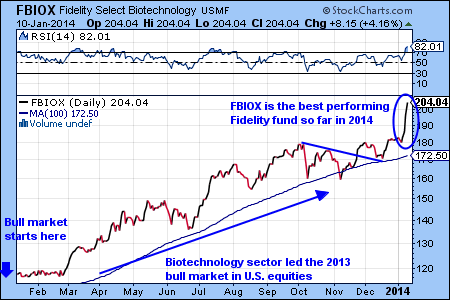 While investing in the biotech sector is appropriate only for aggressive investors, tracking this sector can give us clues about the ability of the stock market to rebound from the correction. “Sell in May and go away” is a well know Wall Street adage that warns investors to sell their equity holdings in May to avoid the seasonal decline of the equity markets. Will the adage prove to be true in 2014? 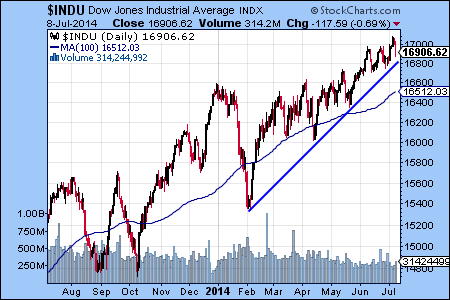 After the outstanding returns of the last 18 months, is the U.S. stock market vulnerable to a serious correction? 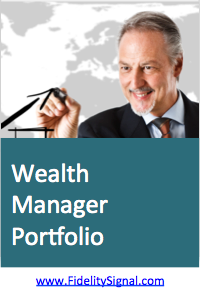 We think that the risks for equities have increased and investors should be extremely cautious in this market. 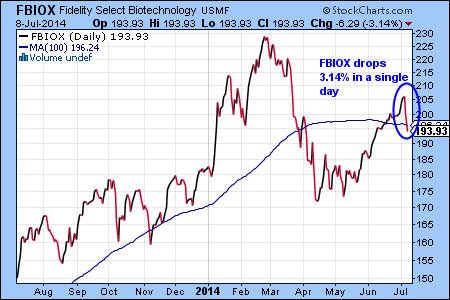 As we noted in previous blog articles, the sector rotation has started a week ago and a correction is under way in the previous market-leading sectors, such as biotechnology and gold. 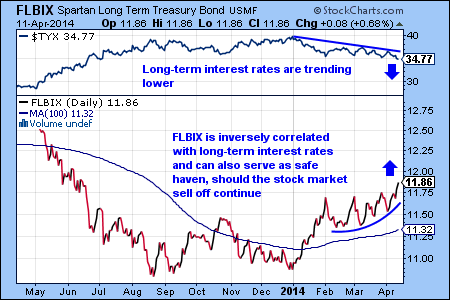 At the same time, defensive investments, including utilities and treasury bonds are in favor again. Geopolitical risks may be on the rise, as well, especially if the military conflict in the Ukraine escalates in the coming weeks.